I hope you all had a wonderful Easter weekend - we sure had a good time. In fact, I'm currently eating a massive salad to get back on track after the tempting candy-fest that was yesterday. Lots of exciting things coming your way this week, including tons of photos if the camera cord I ordered ever comes in! 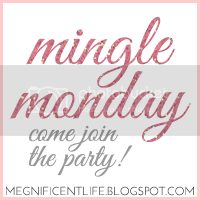 If you're new to Mingle Monday, welcome from the bottom of my heart! This is a fun, positive blog hop that begins on Monday and lasts ALL WEEK! That's right, all week. So link-up, visit some great blogs, and have fun welcoming people who will be heading your way! Reese's Eggs. I could eat them everyday!! And, I also love pastel colored M&Ms...even though I know they don't taste any different. I just love the colors! I'm a sucker for chocolate any time of the year so Cadburry, M&M's, bunnies, etc are that much more tempting around Easter! My favorite Easter treat is Hershey's mini eggs!! Soo yummy, I think I have already eaten 3 bags. i LOVE Cadbury Robin's Eggs! My new favorite easter treat is the chocolate chip cookie dough balls someone made for our easter celebration yesterday...just yumminess! Hi Meg! I'm new to your link-up! Thanks for hosting! My FAVORITE Easter treat is a Reese's egg!!! Favorite easter treat....ANYTHING chocolate. But I also make this fruit salad in homemade whipped cream every easter that I LOVE! I love hollow easter bunnies - it is so satisfying taking the first bite! Thanks for hosting! New follower and I love your blog!! I am totally back on the salads too- have drunk and eaten way too much this Easter weekend!!! Love your blog- new follower from London! My fave eggs are the creme eggs, yum!!! My favourite easter treats absolutely must be Cadbury's creme eggs. But now they're all gooooone! I should've adopted your philosophy and hopped on the Salad bandwagon, but instead I just had a Russel Stovers Milk Chocolate bunny afternoon snack. Yum! Then Blah!! My favorite Easter treat are anything chocolate!